As traditional styles of home decor give way to more modern designs, one of the areas which have enjoyed a burst of creativity is shelving. Where once homes were filled with standard bookshelves, today there is no end to the variety of shelving styles that complement the walls of any room, including kitchens and bathrooms. 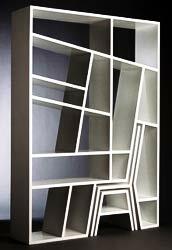 There has been a conceptual shift from standard, vertical, solid, wooden bookshelves to shelving made from any number of materials in any manner of shape, as long as it is capable of holding objects. There are obviously some highly impractical designs, but just like in the world of fashion, the new concepts eventually trickle down into the department stores which then carry a more ‘reasonable’ variation of the original. So for creative shelving ideas, we’ve collected some of the more interesting designs and then moved towards more practical modern shelving. 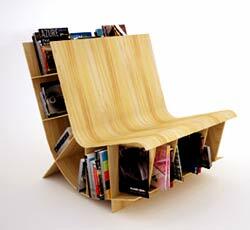 This chair isn’t exactly standard or comfortable, but it is definitely a creative way to store books. 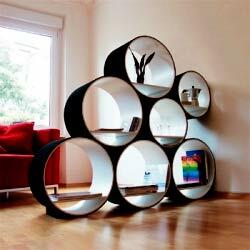 In shelving, we generally see the designs split into two groups: shelving based on the ground and wall shelves. The next design is also ground-based yet is a brilliant manipulation of wood to simulate fluidity whereas most ground shelves give off a very rigid, stiff feel. Though the design isn’t so practical and wouldn’t exactly work in everyone’s living room, we can still take from the general idea when decorating a room in our home and think more in terms of bended wood rather than strictly vertical or horizontal. 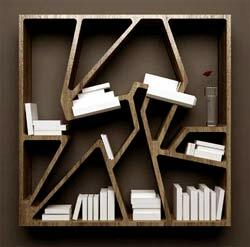 Here is another example of a bookshelf based on a similar concept, though slightly more practical. 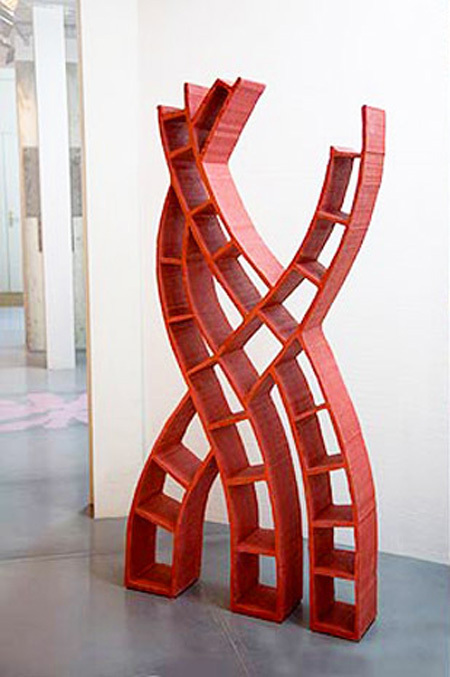 This unique shelving concept bends the wood entirely to create circular shaped shelving. Although it may be strange to the eye at first, it is a very creative use of shelving and can potentially complement any modern living room. Moving on to creative wall shelving ideas, we have here a set of shelves suspended off the ground simulating running. 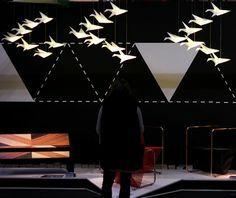 This is a very creative concept, though I’m sure the pricetag on this type of setup wouldn’t be so cheap even though it would add tremendously to anyone’s home. 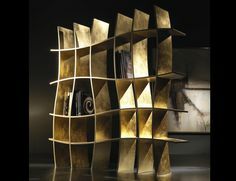 People are willing to spend so much money on artwork; here we have an example of the shelving itself becoming the art. A more practical (and probably more affordable) single unit of wall mounted shelving can also add to a room. 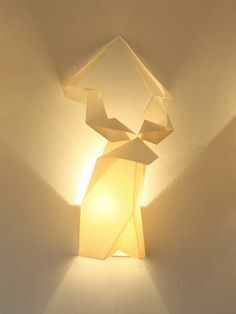 This smaller unit has a very dramatic design and would have a pronounced effect on any wall it is placed on. Notice that on these types of shelves, stuffing them with all sorts of books is not exactly the best use. A delicate blend of novels mixed with modern accessories will help keep them from looking cluttered and maintain the contemporary feel created by the shelves themselves. just wondering where the very top right one is from?? Where can I acquire the last piece? Good luck with your project! 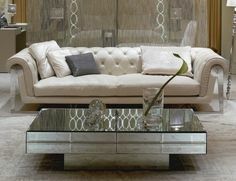 We’re happy to showcase designers and architects if you’d like to write an article about your work and design concepts. Hi, I’m an interior architect and would like to know more about that suspended bookshelf with the concept of running simulation. 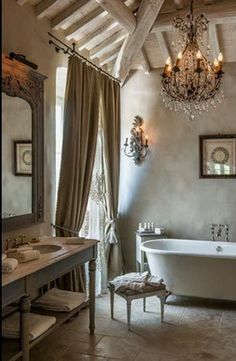 What is the name of the shelf and if possible would there be a larger image of this shelf. 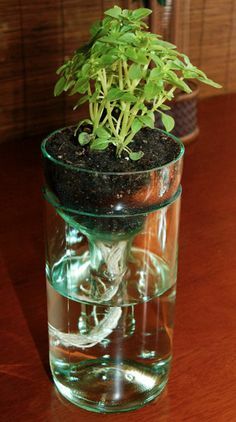 I found it VERY interesting and would like it to be included in my upcoming design project.